ski | Meghan Kelly Teles! It was a good one! I was able to ski a lot… it felt like this magic window of time where Mother Nature delivered an epic winter and my kids weren’t quite old enough to want to hit the magic carpet every day. Here’s a quick edit I put together with some of the highlights! What do you do when you receive a voicemail message from Lynsey Dyer describing the opportunity to film for Pretty Faces in Alaska? a) Think long and hard about it and then decide to keep building your savings account for a rainy day. b) Think, that’s nice, but according to my Outlook Calender, I have some work obligations. c) Do some spastic dance moves, try to hastily call her back, get her voicemail and go promptly online and buy a plane ticket. If you chose c, right! 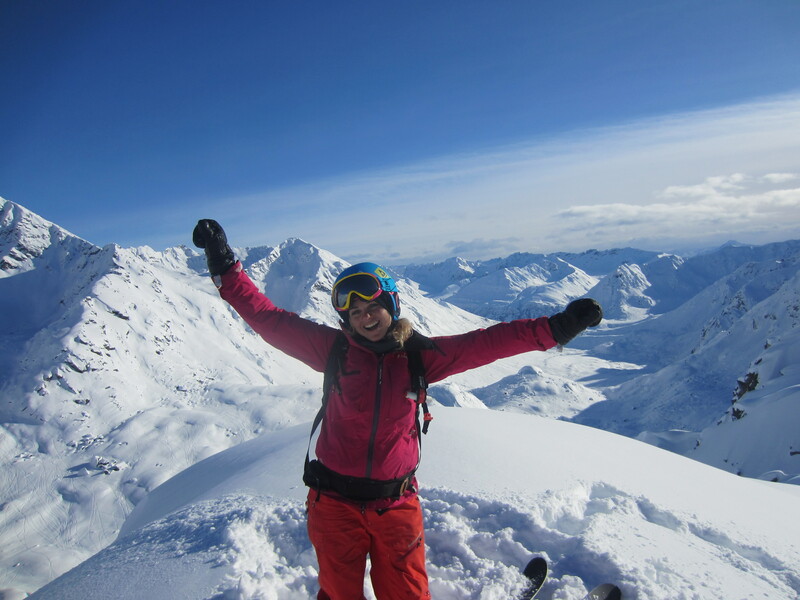 Like every big mountain skier, it had always been a dream of mine to ski in Alaska – with the crew of Lynsey, Sandra Lahnsteiner, and Rachael Burks made it a dream squared. Arriving Saturday afternoon, I met up with Girdwood local Brooke Edwards since Lynsey, Rachael, and Sandra had arrived the night before and were already out filming. It was dumping in Girdwood so we decided to head up to Alyeska for some night skiing. 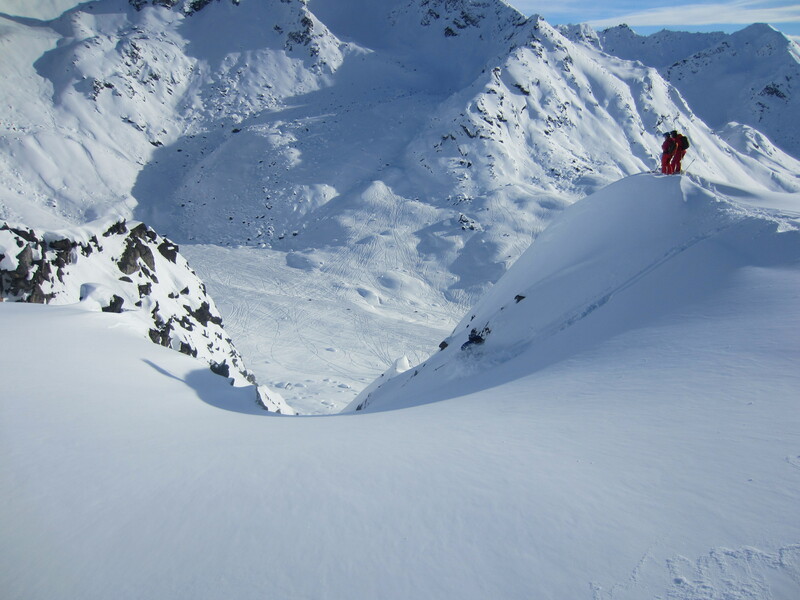 It was surreal having flown in that afternoon and be shredding Alaska powder that same evening. We found the rest of the crew at the top of the tram for the last run of the night and had a memorable party shred on the way down. I could just feel the energy with this group in this place – it was like reconnecting with old friends even though I just met some of them. The next day we headed out on a sled mission with our crew of local guides and skiers, our filmer Josh from JGS Concepts, and photographer Scott Dickerson. 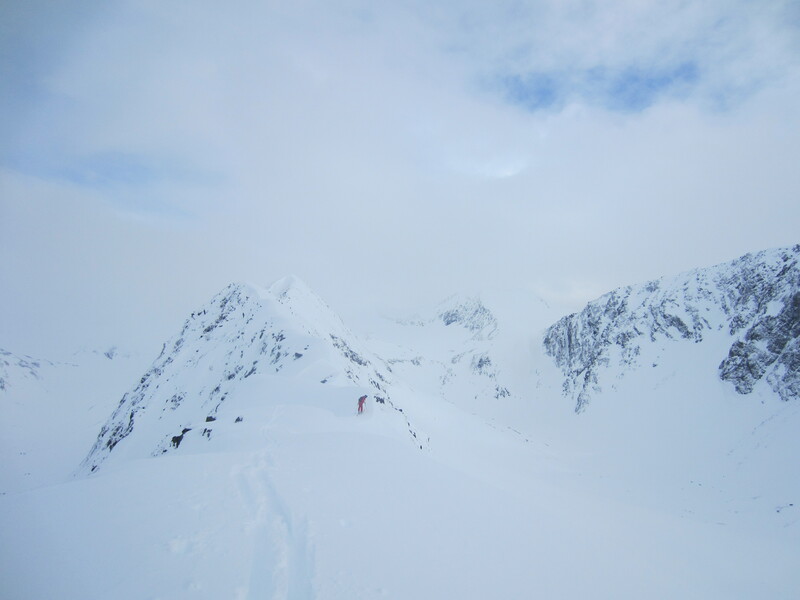 We didn’t expect to get much light that day, but in the afternoon, we started seeing pockets, so we headed up to ski a face that called to us. 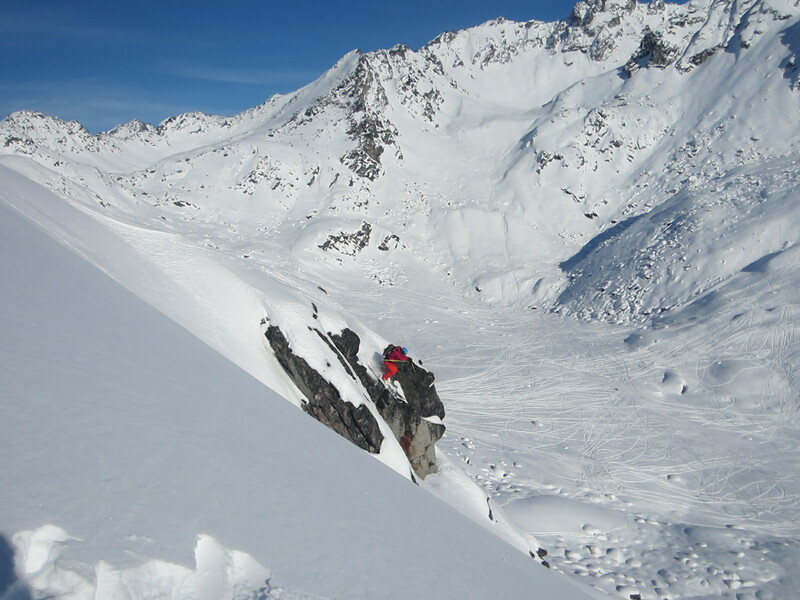 Being doubled up to the top proved to be somewhat challenging, but we made it as far as possible, bootpacked a little further, assessed the cornice as a group and decided where to drop in. 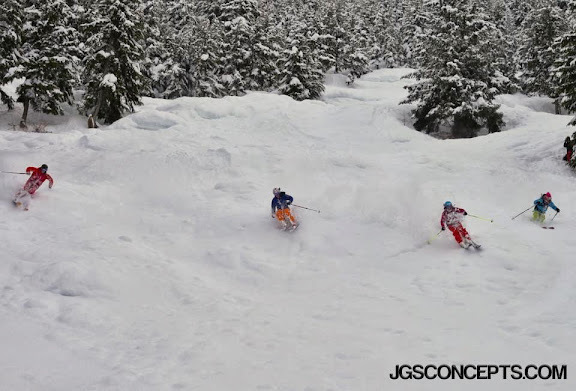 I’m not sure what was scarier, dropping into my first Alaska line, skiing in front of 3 of my skiing idols, or doing it all in front of the camera, either way, I just decided to drop in first and rip turns down the face. I couldn’t see anything in the flat light and took a bit of a tumble right back onto my skis and kept skiing and had a good laugh at the bottom. Good to get that out of the way! Rachael checking the line while the light goes in and out. 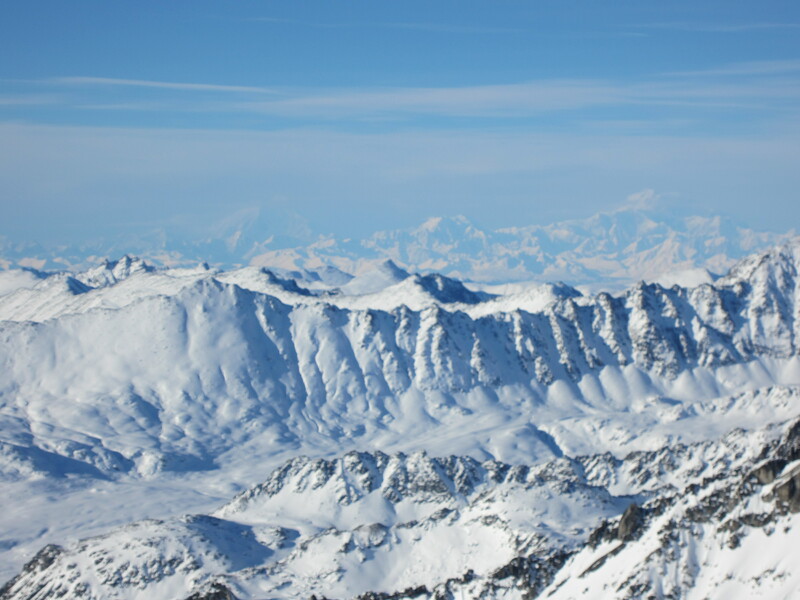 As we would learn during our trip, weather is the biggest challenge in Alaska. To ski bigger lines, we needed good light. Tales of blue skies sent us north to Hatchers Pass the next morning. En route, we picked up sleds generously donated by Alaska Mining Co for the week. 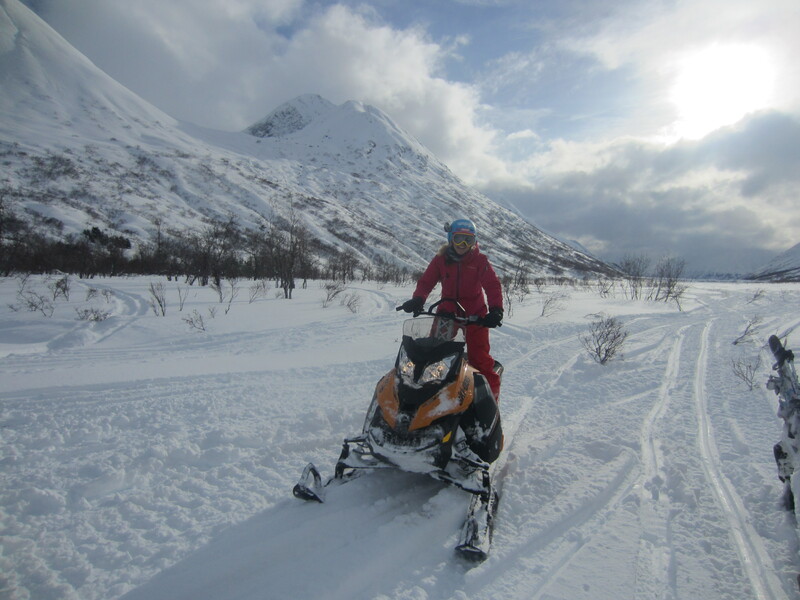 I was lucky enough to get to drive one of these as we headed out to scope lines – pretty amazing to go from getting doubled, to riding Canadian style, to driving our own sleds in just a few days! We picked out a few lines but by the time we got to the top, the light was no longer good for filming, so we decided to preserve them for the following day. We then skied an amazing powder run, a few mini golf lines, and some fun little pillows – another warm up day, but we knew tomorrow was game on! We found a cheap hotel in Palmer and after a memorable night on the town, arrived early to ski the lines we had chosen the day before. One by one, we checked off the lines, sometimes we nailed them and sometimes we didn’t, but it was such a great day in the mountains, everyone was all smiles. We even had professional sledders Carly Davis and Jamie Hollis with us. 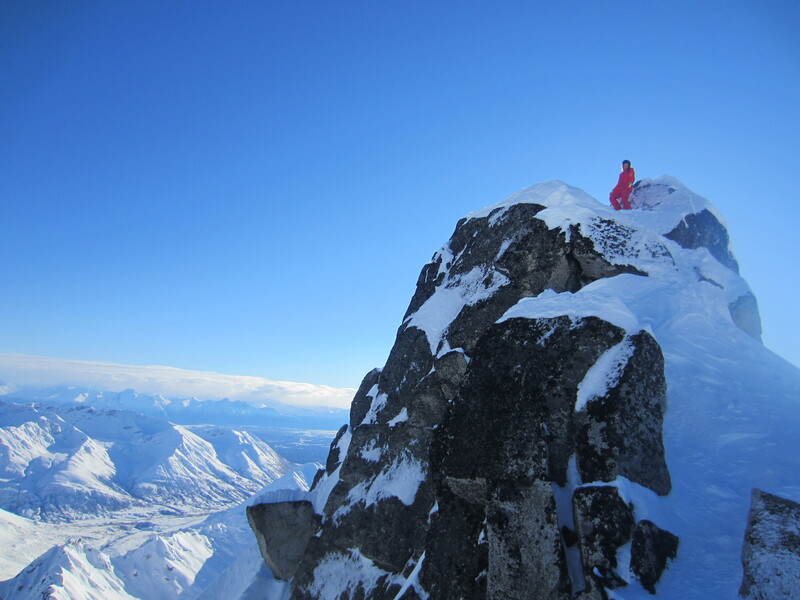 It was so cool to come down from skiing your line and then look across the valley to see the sled girls sending it! Tele turn into my first real Alaska line as strawberry and raspberry look on. Sandy, aka raspberry, sending it! 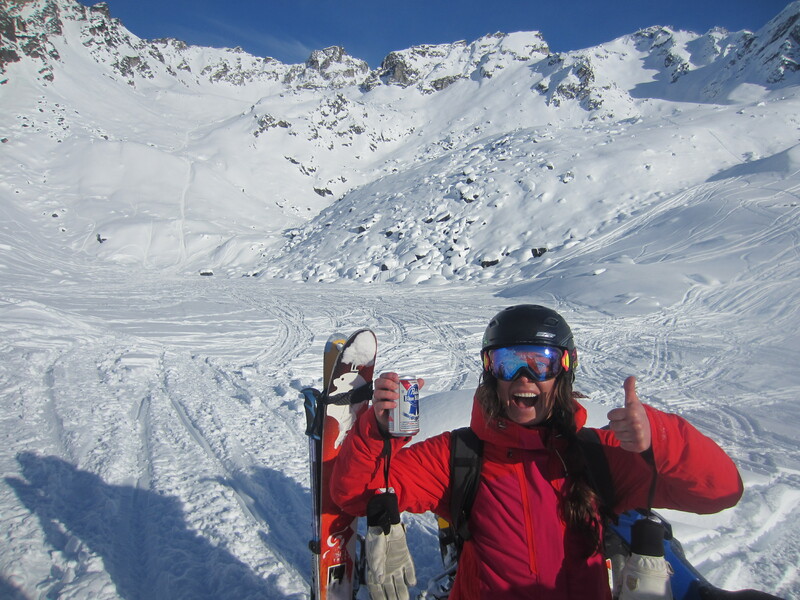 Rachael is pumped on her line and getting the PBR of the day. Back in Girdwood, it was still snowing! 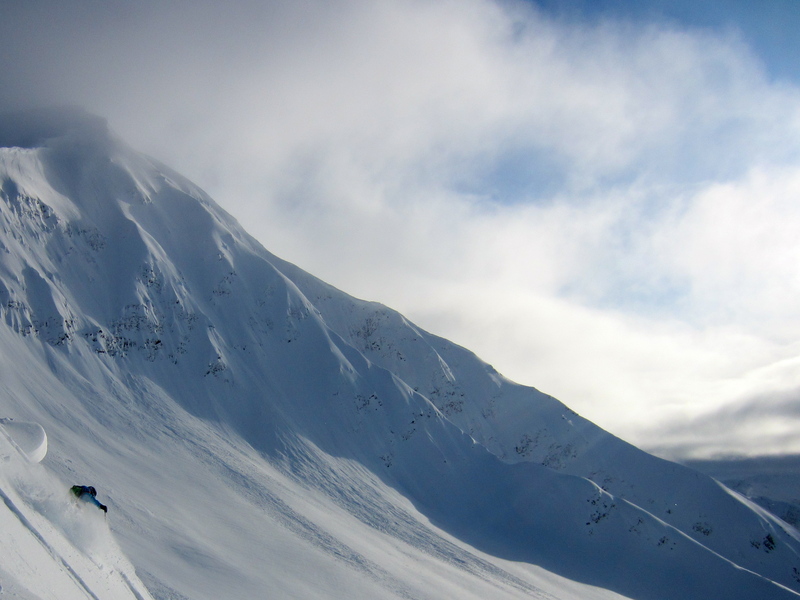 We shredded powder a few days at Alyeska, some for fun and some for film. The snow was amazing and we had fun popping off pillows and watching each other shred. We had a few weather days where we killed time shooting guns, “icing’ each other, and doing yoga – you know, girls stuff. My first time shooting guns. I didn’t really know how to feel about it at this point! Scared! The time flew by and it was Rachael’s last day and blue was in the forecast! 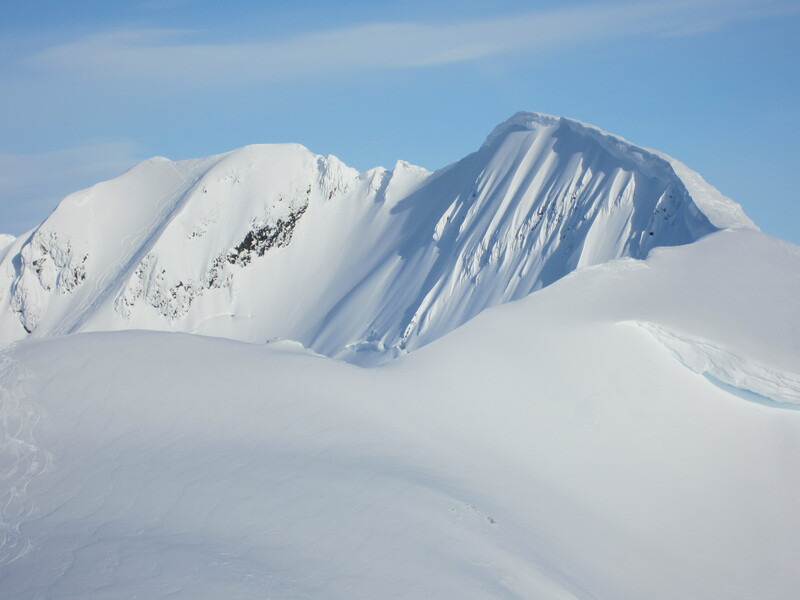 We headed down to Cooper’s Landing with sleds to an area with various size lines in the same cirque. We all stomped our first line and celebrated at the bottom before heading back up to ski another line. Lynsey proceeded to ski a beautiful line down some spines, Sandy sent a spine about 30 feet, making it look effortless, and the day was capped off by Rachael sending a 40-50′ backflip off a spine feature! That fired everyone up and Lynsey exclaimed “Girls skiing is soooo boring!” and we all laughed and high fived and proceed to shred perfect Alaskan powder to the bottom of the slope. This was my first winter trip to Alaska and my first filming trip ever. I’m not a well known skier and I don’t have a ton of sponsors. I’m 33, married, and have a full time job so most of my feelings during this trip were of incredible luck and gratitude. Still, we had ups and downs – we chased light and failed, we awoke early with detailed plans only to find the weather had changed, we dropped into lines that were not the lines we thought, our filmer injured his knee and wasn’t very mobile, we had to learn to trust our sled drivers and each other, and, even though we are women and talk more than average, we had to learn to communicate as a group. I couldn’t have been on a better first filming trip though – if I was scared at the top, it took a smile from Sandy, a pole tap from Lyns, or a few stoke-filled words from Rachael to help me momentary forget my fear, focus, and ski for fun all the way to the bottom. The best part was, that regardless of what happened that day, we’d have sore abs from laughing and creased cheeks from smiling. And we’re all better from it… we just can’t wait to go back. 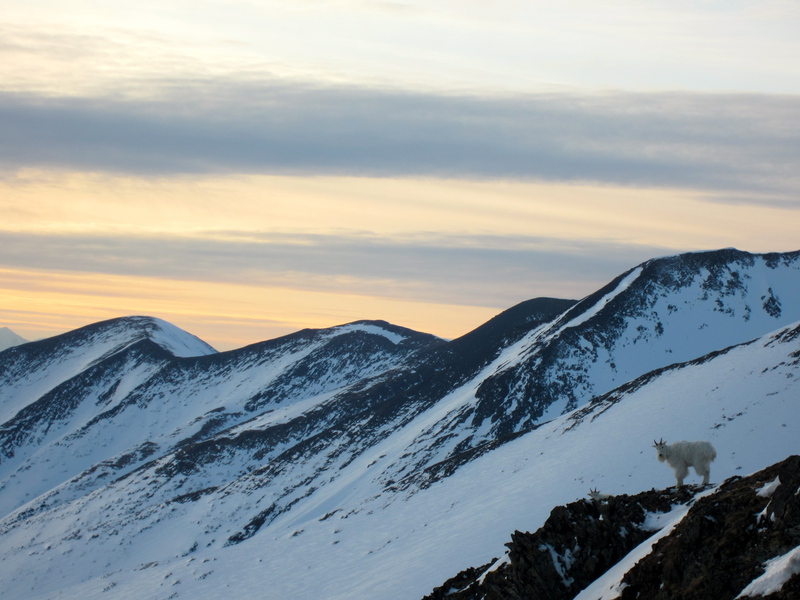 I think that is how everyone feels after skiing in Alaska. Special thanks to Jeff, Adam, Chris, Collin, Josh, Cody, Matt, Scott, Cedric, Brett, Brooke, Mikey, Paul, Alyeska Ski Resort and everyone else who helped us along the way. It has been snowing a lot for December. In fact, it was announced that it was the 2nd snowiest December on record for Tahoe! It’s also been staying cold, keeping the snow in great condition. The backcountry was somewhat unstable for a while, but things seem to be calming down now and the Sierra Avalanche Center has downgraded the avalanche danger to low. I was a bit too busy skiing to document things, but here are a few photos I snapped and a quick video of one of our runs from the top of Heavenly down to Gardnerville.